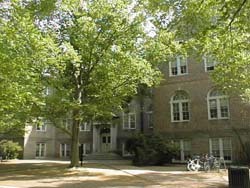 Washington Hall is located on the Old Campus between the Sunken Garden and Jamestown Road. The Anthropology Department is on the ground floor, with entrances on the east and west sides of the building. You may want to print out a map of campus (Washington Hall is building #146). Visitors are encouraged to obtain a Visitor Parking Pass, available for a fee from Parking Services at 201 Ukrop Drive. With a Visitor Parking Pass, you can park in any campus space designated for visitors, faculty/staff, or students (unless restricted "at all times"); and, if appropriate, at any space reserved for the disabled.